The Link is particularly noteworthy for its diversity. Not only is the field species-spanning and multi-disciplinary, it also merges innovative programs and legislation with groundbreaking academic research to create a sparkling synergy. The research gives credence to programs and legislation, which in turn develop these findings into practical applications and public policy that advance the institutional development of the field to better protect the safety of vulnerable people and animals. Our bibliography of research studies continues to grow and currently has over 1,200 entries. However, significant gaps remain in our understanding of how animal abuse interfaces with interpersonal and community violence. This emerging academic endeavor offers untold opportunities for students, scholars and dedicated professionals from many fields to explore new dimensions of the complex and multidimensional relationships between humans and other animals. New research facilitates ongoing discussion, transcends professional boundaries, and channels Link advocates’ prodigious talents into exciting new directions for the future. Industrial Cruelty to Animals: How does employment in work such as slaughterhouses impact community rates of domestic violence, child abuse, and other crimes? Demographics: In the absence of census data on pet populations, how might we gain accurate estimates of companion animals in communities and correlate these against socioeconomic data and rates of domestic violence, child maltreatment, elder abuse, and other crimes? Equine and Livestock Issues: Most Link research to date has focused on abuse of companion animals as potential harbingers or indicators of interpersonal violence. How might large-animal welfare issues, particularly in rural communities, impact The Link? Substance Abuse: Is drug and/or alcohol abuse a confounding factor in Link incidents of animal abuse and interpersonal violence? Pet Protection Orders: As more and more states enact laws allowing courts to include companion and/or farm animals in domestic violence protective orders, how effective are they? How many such orders are being issued? Do they serve to facilitate survivors’ escape from abusive situations? Mandatory Reporting: As more state laws and professional policies mandate veterinarians to report suspected animal abuse, how effective are they? How many cases are reported and what are the outcomes? Have any negative repercussions occurred? Cross-Reporting: Only a handful of states have mandated cross-reporting between child protection services, adult protection services, and animal care and control services. How many such cases are cross-reported, and how effective are they? What could be done to improve these systems and make cross-reporting more institutionalized? Animal Behavior Issues: Research has linked histories of animal abuse with human dog bite fatalities. Animal behavior issues often cause a domestic violence abuser to lash out at whatever targets are most convenient. How can we do a better job of training people to better understand and respond to the behaviors of their animal companions? 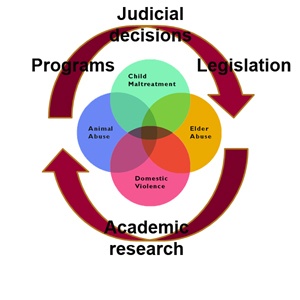 Child Sexual Abuse: Limited studies have suggested that threats of animal abuse may be used to coerce children into sexual abuse and to maintain their silence, similar to more established studies of this phenomenon in domestic violence settings. How might we develop more research to explore this issue further? Response by Teachers: What are the responsibilities and best responses by educators who suspect animal welfare issues among their students? Humane Education: For 150 years, humane leaders have advocated for school curricula that impart kindness and compassion to animals, and states sometimes mandate such instruction. How effective are such programs, How do we evaluate the impact of humane education? We welcome your additions to this list!